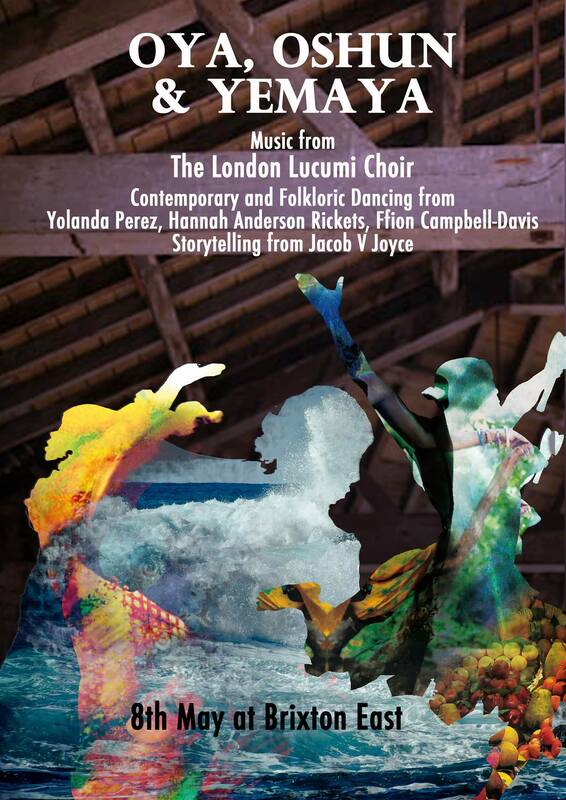 The London Lucumi Choir is the FIRST non audition community choir of it’s kind in the world mainly singing Songs dedicated to Orisha accompanied by traditional drumming. 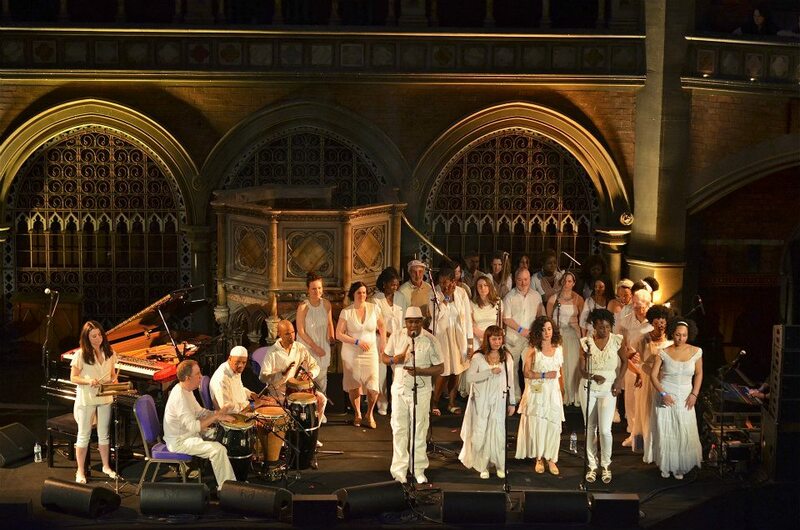 Biography: The London Lucumi Choir was formed in November 2006 by Afro Cuban Singer Extraordinaire Martha Galarraga and Musician Daniela Rosselson De Armas and assited by Dave Pattman ( Omo Aña) after many years of running voice workshops dedicated to singing songs for the Orisha. (Yoruba deities) It is the first non audition choir of its kind welcoming members regardless of age. We have members aged 15 to over 70 from all walks of life. 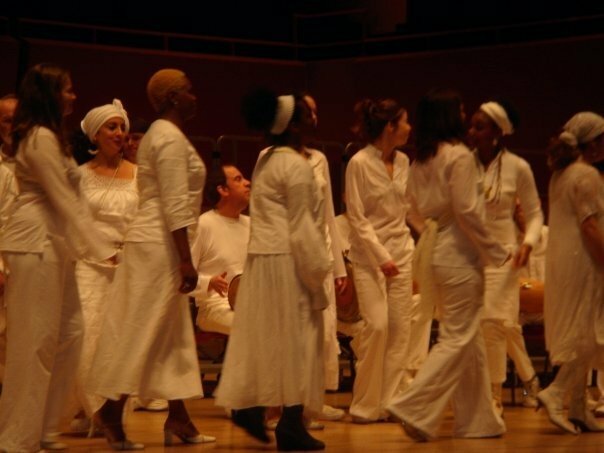 The choir sings songs to the Orisha accompanied by traditional Bata Drums and occasionally other Afro-Cuban Genres, but with original arrangements by MD Daniela. 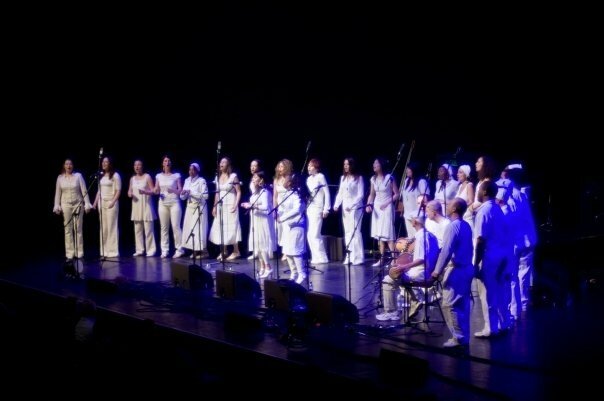 In it’s short life the Lucumi Choir were category finalists 2008 at BBC Radio three Choir Competition of the Year. They opened for Eliades Ochoa at London’s premier venue, the Barbican in 2009 and went on to play at the Open Rehearsal initiative and Voice Lab presents at the South Bank and also played alongside established bands such as Yoruba Andabo at the Barbican 50 celebrations. In 2013 they supported Buika at a sell out concert for La Linea, the UK’s Premier international Latin Music Festival. FUNDING: In 2009/10 they gained funding by The Arts Council and the BBC Choral Ambition Fund in order to put on an original composition by Juwon Ogungbe “Time and the Trickster’s Heart”. Choreography was added to the performance by the Union Dance Theatre. In 2012 they launched their first CD which has had a five star review by the late Jan Fairley in Songlines. The CD was launched at Rich Mix in April 2012.
and were consequently nominated for the Songlines World Music Awards. The CD was a result of the Director’s funded research trip to Matanzas as a Finzi Scholar. They have come second place in the Lukas Awards two years running. They have performed several times at Rich Mix, and have performed at the Brandenburg Choir festival and Soas Interfaith Music Festival 2013/2014. They have performed on Radio London, Soas Radio, Ben TV Many a festival including the Choir Festivals at the Roundhouse and Southbank, The “Vamos” Festival in Newcastle,” Voices Now”, Camp Bestival, “Go East” organised by The Barbican. Church performances include St Ethelburgers, St Johns in Waterloo, the Crypt in Kings College the Strand. 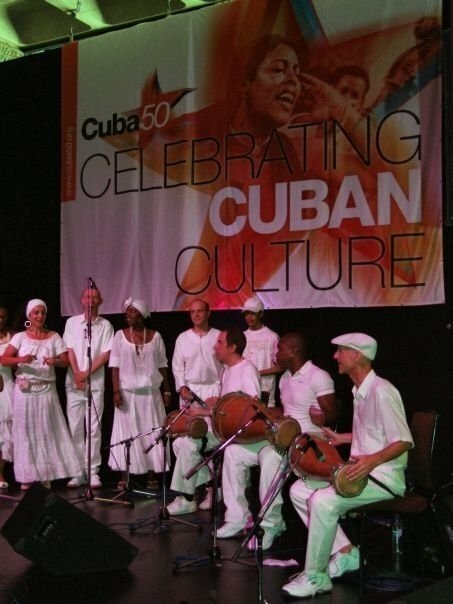 They performed at the Merlin Theatre in Frome as part of “Afro Cuban sensibility” event curated by Lekan Babalola. They played at Jamboree in Cable Street hosted by Jamie Renton. In 2013, Daniela R De Armas celebrated the birth of her first Granddaughter by producing a CD of International lullabies. This has yet to be launched although it is available online. Charity events include concerts raising money for Water Aid and Heart Research UK. They also have performed in various schools in the London Area as part of Black History Month over the last two years. 2014 performances introduced the dimension of story telling by Spoken Word and Visual Artist and Activist Jacob V Joyce at Ghost Hostings and Survival Guides Brixton. The Choir is open to all and those who are interested can contact londonlucumichoir@wildindigo.com This Blog will replace the old webpage for the Choir and hopes to upload thoughts the process of running such an unusual choir, Videos, photos, and other interesting links. Please find time to scroll and have a look and if you want to feedback please do! Links to posts by pressing the Menu tab. We look forward to hearing from you. My name is Maria and I’ve been a fan of LLC for several years. I am reaching out to make an inquiry. I will be spending some time in London this summer, it will be my first visit. Do you have any upcoming shows or workshops scheduled? Also, as an ordained Lukumi Priestess, I will be doing some religious work while I am there, and am wondering if there are there any botanicas in London? Or stores where I could purchase items we usually use to worship and for rituals? If not I will ship items ahead of me from my son’s online store. I hope to be able to enjoy a performance or two while I am there, and would be thrilled to participate in a workshop. I thank you in advance and appreciate any feedback or guidance you can offer. Hi I am a Yemaya initated in Cuba, I will travel to London this Fall in Nov, is there any event by then? At present we are rehearsing for recording and unlikely to be taking on any performances in November, however you are very welcome to take part in a rehearsal whilst you are here. We would be happy to meet you and have you involved.